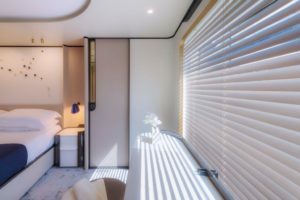 After the world première at the Cannes Yachting Festival, the Azimut Grande 32 metri (that has Achille Salvagni’s Interiors) has been on display also at the Monaco Yacht Show. 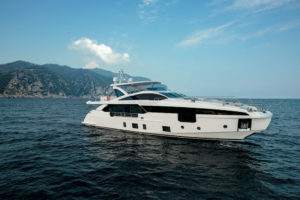 The Azimut Grande 32 Metri is avant-garde in every sense, not least because of the multiple unprecedented solutions that establish its right to a prominent position as one of the world’s most advanced and modern superyachts, or the advanced naval platform that is packed with technology: the combination of Carbon Tech, D2P® hull and wave piercer (which increases the length at the waterline by 1.8 meters), results in peerless consumption efficiency. In addition to the technology, Salvagni worked on the spatial composition with an extremely sophisticated architectural approach and never using decoration for its own sake. 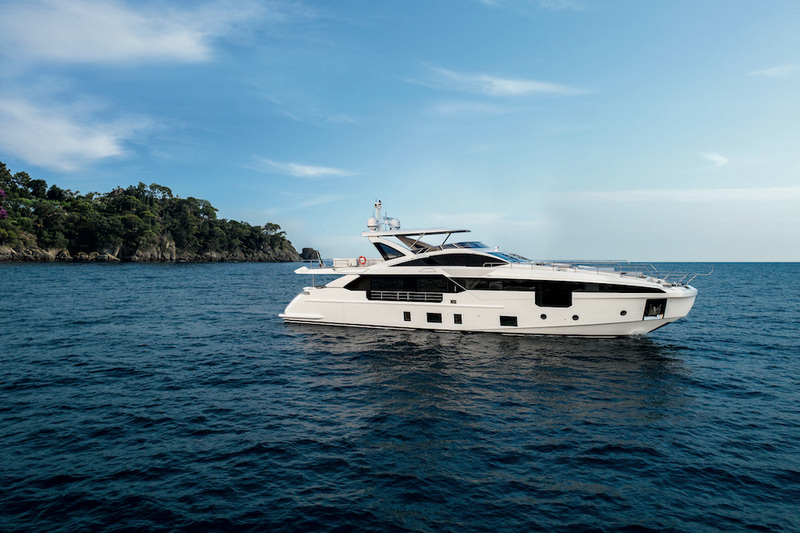 Stefano Righini, a longstanding partner of the shipyard, has crafted powerful exterior lines, with stylistic features that sweep steeply towards the stern, hiding the spacious interior volumes. 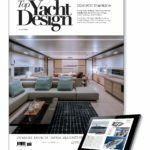 The full-height glazed surfaces in the bow, which have been given an original placement that straddles both the hull and the superstructure, contribute to lightening the effectively perceived volume of the boat. The vertical bow, a style feature created with the first S generation and also present on the Fly range, is now effectively one of Righini’s hallmarks, making the yacht extremely liveable. Righini’s distinctive design features on the Grande 32 Metri, making it absolutely unique in its category, are the spacious stern beach club, the lateral garage that can house a 5-meter tender and a 3-meter jet ski, the huge full-height glazed surfaces on both sides of the full-beam owner’s suite, and the highly expressive and character-building vertical bow. The Fly Deck has a usable surface area of 70 square meters and features smooth lines and curves where accessories and furniture seem almost suspended in mid-air. 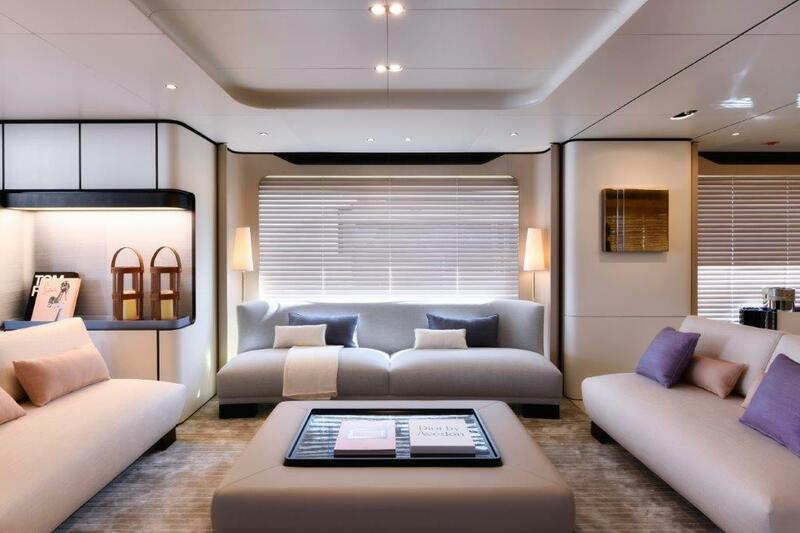 It consists of three areas: the bow space designed for dining, a central section decorated like a living room and, finally, an area in the stern that can be furnished with a hydro massage tub and a sun lounging area, or as another lounge. The stern beach club has a total surface area of 18 square meters and is available in two different versions to meet owners’ needs. The first more classic version is ideal for diving and water sports, with furniture and storage designed to hold the equipment needed. 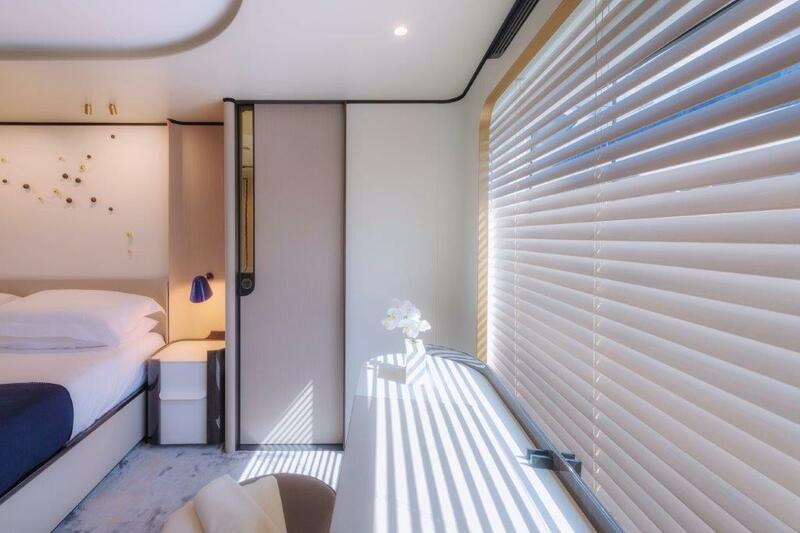 A second version has been designed by the shipyard for owners who want the utmost enjoyment from the sea on a sophisticated water-level terrace. A structure with four carbon poles and super lightweight organza awnings protects the outdoor area and creates a unique covered terrace, adding a distinctly original touch of elegance. Inside, the sense of sophisticated harmony continues to permeate the constituent features of the new model, maintaining a family feeling with the other two Grande units designed by Salvagni, one of AD Collector’s top 100 international designers and included on the A-list drawn up by Elle Decor USA. His approach continues to eschew pure decoration and focuses instead on spatial composition: fluid surfaces detach from the walls to form an independent system, using spatial elements that flow seamlessly while nevertheless establishing distinct volumes. The settings are at one and the same time welcoming, simple and sophisticated, playing on the harmonious balance of detail and function. The walls embrace and expand, like a succession of negatives and positives that fix and expand space. The spaces are divided on the basis of a succession of contrasts between full and empty, between polished dark wood surfaces alternating with portions of ceiling and large areas featuring light-coloured woods. 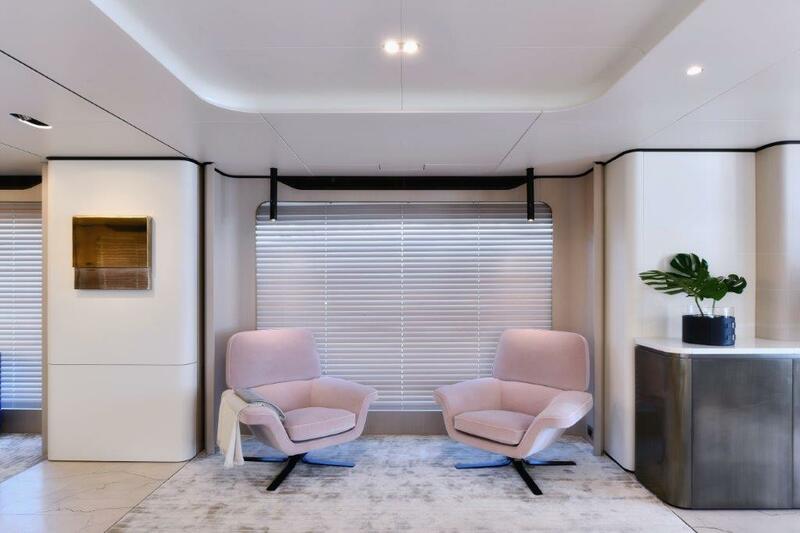 Every detail, no matter how small, has been carefully researched to convey and celebrate the key themes of the interior design: selected pastel elements stand out against the broad chalk and butter-coloured leather surfaces, infusing them with a sense of wellbeing and suggesting an atmosphere of complete relaxation. 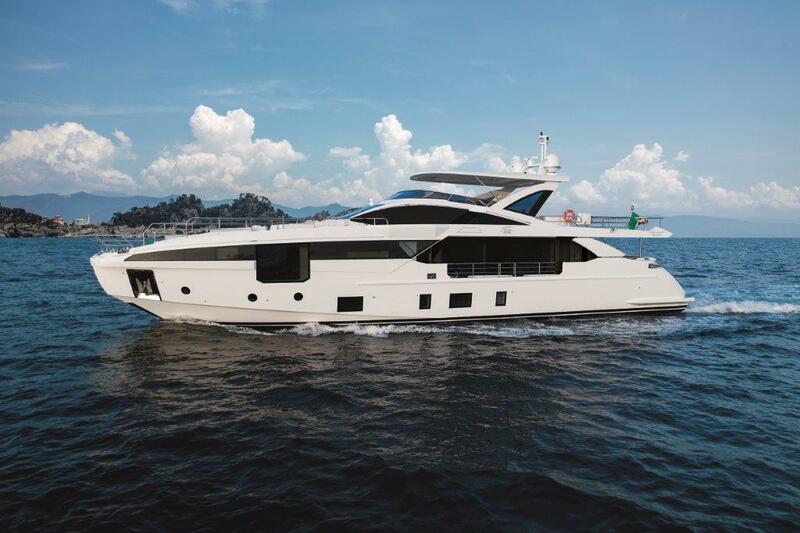 Grande 32 Metri has a Raised Pilot House on an elevated half-deck between the Main Deck and the Flybridge. The kitchen can be accessed directly from the crew area and the lateral passageway, giving the crew full independence of movement. The lobby and the staircase to the guest night area are characterised by soft, flowing lines, designed by Achille Salvagni in accord with the overall harmony-inspired conceptual approach, as well as to facilitate ease and convenience of movement. The bow area is set aside for the full-beam owner’s suite. Spacious and flooded with light, it has a centrally-positioned double bed between two walls made up entirely of big full-height glazed surfaces that extend down to the floor. On request, a portion of these glazed surfaces can be fitted with gullwing windows. 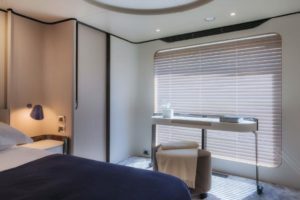 The Lower Deck, on the other hand, is given over to the guest night area and contains two big VIP cabins, both with double beds and facing each other, and two cabins with twin beds, sleeping a total of eight. 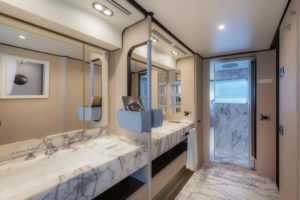 Each cabin has its own en-suite bathroom. 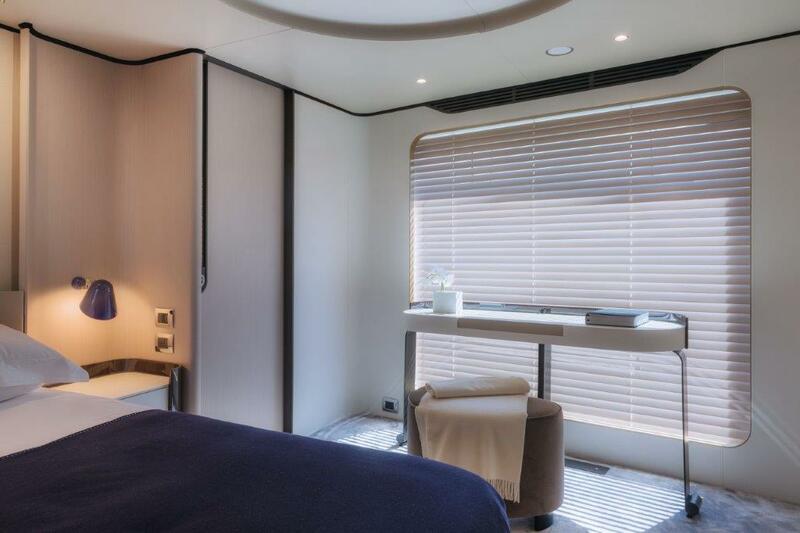 The refined, evocative decoration of these cabins sets off light-coloured, matt woods against darker, polished varieties. Various inserts feature exclusive materials like treated brass, bronze and steel to give these sophisticated settings an even more accentuated personality and suggest a mood of refined calm. The entire superstructure is laminated using Carbon Tech with the addition of vinyl ester and epoxy resin, reducing the weight of each individual part laminated in carbon by a value over 30%. 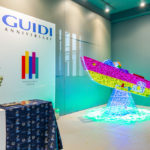 The D2P® Displacement to Planing hull, designed by Pierluigi Ausonio with the Azimut | Benetti Research & Development center, is the result of years of a major design study based on the combined use of proprietary CFD software, FEM analysis and multiple tank tests performed at the Brodarsky Institute in Zagabria. This sophisticated and innovative hull has a wave piercing bow that increases the length at the waterline by 1.8 meters, resulting in a significant improvement of the waterplane coefficient in displacement mode, reduced hull resistance as a result and, finally, a sharp improvement of wave strike in rough sea. The second key feature of the hull is the double-chine, which reduces hull resistance at sustained cruising speed and improves stability in displacement mode. The combined effect of Carbon Tech and the exclusive D2P® hull delivers maximum consumption efficiency levels. Comparing the efficiency of this new generation hull against that of boats of the same size built in the early 2000s by the same shipyard, reveals a percentage performance improvement of up to 30%. Onboard comfort is the result of care lavished on even the tiniest detail, starting with the production and construction process. This involved concerted efforts to reduce noise levels by using elastic systems for the propulsion system transmission, as well as the introduction of modal analysis in the design process. This latter technique, borrowed from the aerospace industry, is used to study and predict the potential stresses and vibrations to which the surfaces will be subject, so that structures can be created that minimise them to achieve excellent acoustic comfort. The efficiency of the hull and weight reduction achieved with the use of carbon fiber deliver significant benefits in terms of range. 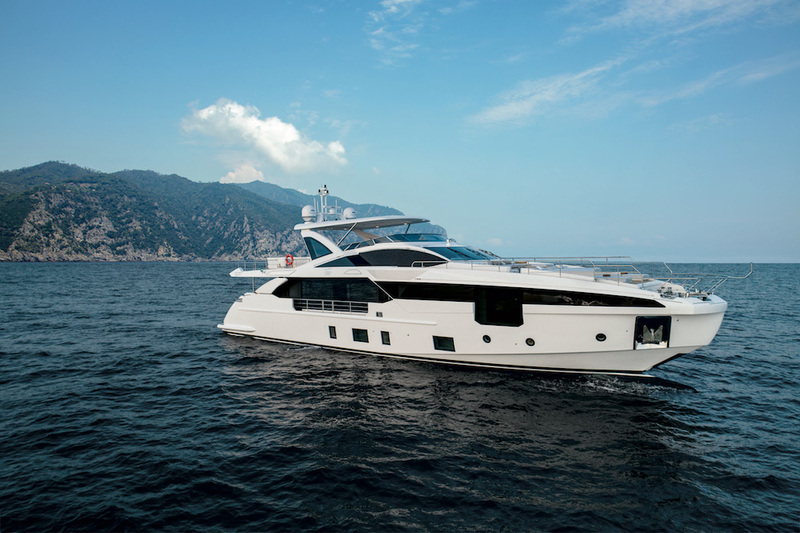 So much so that with a displacement speed of 12 knots, the Grande 32 Metri has a range of 1,000 nautical miles. The engine room is fitted with a pair of 2,200 mHP MTU model 16V M86 units, driving the yacht to a maximum speed of 26,5 knots, while the cruising speed has been calculated at about 21 knots.